You buy locally sourced grass-fed beef. But where is it processed and how far does it travel before it hits your grill? Hilary Achauer explores how the slaughterhouse can affect our environment and our health. James Holtslag stands in front of a crowd with the hindquarter of a steer on the table in front of him. Wielding a cheap, flexible knife, Holtslag begins disconnecting the muscle from the connective tissue. He describes what he’s doing as he works. It’s a Thursday night in August. A crowd of about 70 is hanging on his every word. As Holtslag carves up the steer, the cuts of meat are rushed to the kitchen, where they are being turned into a six-course dinner. The demonstration is part of a special event at Alchemy Restaurant in San Diego, Calif. Holtslag and Trey Nichols, who are opening San Diego’s first whole-animal butcher shop—The Heart and Trotter—organized the event. But before anyone can eat, Holtslag has to finish carving up the steer. The hindquarter in front of us has a faint, almost earthy odor. 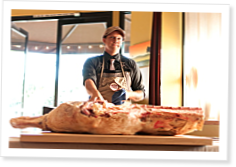 Holtslag leans his whole body into the steer, but the process is almost silent as he carefully separates meat from bone. This experience is a far cry from buying a plastic-wrapped cut of meat in the grocery store. Consumers have typically been shielded from the slaughtering and butchering as processors break the link between the living, breathing animal in the field and the piece of meat sizzling on the barbecue. But where and how an animal is killed can impact the health and safety of the meat. And that sterile-looking meat in the grocery store? It might not be as safe as you think. A look inside the juice-cleanse trend. Teresa Godfrey (not her real name) wanted a break.